My favorite thing to do with leftover rice, besides eat it plain with butter, is make rice pudding. 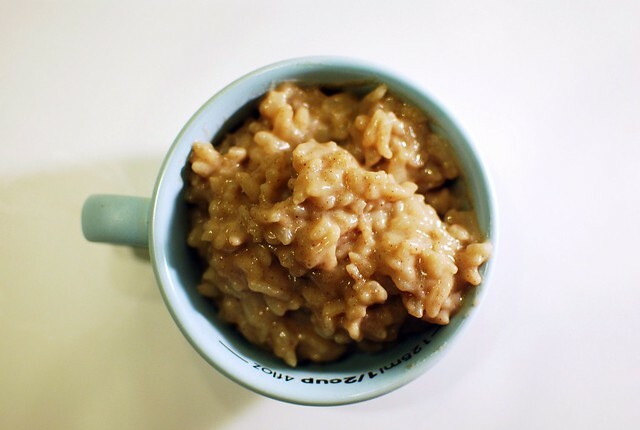 I'm kind of shocked I've never posted a recipe for rice pudding, because I make it so often. This is a variation on the kind I usually make with milk, which I guess I'll post some other time. I discovered a can of coconut milk in the cabinet (don't you love that?) and have been thinking about rice pudding. I couldn't find a recipe, so I made up my own. Combine everything in a small pan. Cook over super low heat for 10-15 minutes until the rice has absorbed most of the liquid. Let sit for a few mins, then dig in. If it's too thick, add a tiny bit of milk or coconut creamer or milky beverage of your choice. If it's too thin, cook a little longer. Jill you're so good at making/taking pictures of food. I wish I ruled as much as you did at making food. I love rice pudding, and since I don't do dairy, coconut milk is such a lovely indulgence.